Glass Beach: Happy Valentine's Day! I made Valentines this year for the first time in a long while! 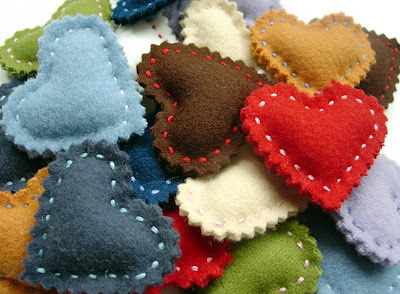 They are little felt heart pins and I think they turned out quite cute, if I say so myself. The pins came about through a harmonic convergence of the perfect project and materials I already had on hand. I got a lovely stack of felt squares via Jenn's blog a long time ago. The squares sat sadly in my craft closet until I found Purl Bee's Valentine Pin Tutorial. The project was fun, fast and easy. I also got to spend some quality time with my pinking shears (which as a serious sewist, I'm embarrassed to admit I've never used). I mounted each pin on a little card and sent them off to some of the special women in my life - family, friends, the kidlings' teachers and some of my crafty heroines. I even managed to save one for myself. I hope you have a wonderful Valentine's Day!! You're very welcome, Jenn! Thank you so much for the felt and keeping me inspired. Liz - thank you very much (and you should keep an eye on your mailbox...)! What a wonderful surprize to open this little box and see such a lovely and cute handmade heart :) Thank so much! !